Renascence IT Consulting | "Bringing new life to your network"
A new vulnerability was found that targets Adobe Flash and the only way to protect yourself, according to Adobe, is to uninstall it. This attack vector works against PC, Mac AND Linux systems and seems to be started from phishing emails. Once used, it can allow someone to crash or even take control of the compromised system. If you need any assistance with how to remove this and protect yourself and your business, please contact us at sales and we can make sure we stay on top of your technology so you can stay on top of your business! As a Managed Service Provider, finding the right tools to service your customers can be a very daunting task. There are many different options for supporting the back end of your company, while maintaining optimal service for your clients. For us, it took close to two years and many less than successful products to finally find the ones that worked for our company, and our customers. One of the main sticking points for me has been that I need to have good communication with those providers. If there is a problem with a product, I need to have a rapid response so that it does not affect my support, and to a bigger extent, the trust I have established with businesses who depend on us. It was not an easy journey as it cost us many hundreds of hours of installing, testing, making a decision to not continue with a product, and ripping it out to try again with another ‘touted’ vendor. At Renascence IT Consulting, we care about the integrity and performance of the tools we use and constantly re-evaluate them to make sure we are offering the best in class services you, the client, deserves. An article from BBC.com reports that cyber-thieves are making a mint off your computers and your pain. They can make over 1500% when investing in ransomware software and deploying it on a vulnerable website. Ransomware is malware that, when installed, will encrypt your machine (and possibly an entire network) and hold it hostage. Victims are forced to pay hundreds to thousands of dollars to recover their data from the encryption as well as lost time for their own business as well as credibility. It is estimated that criminals can purchase a "kit" for $5900 and, if deployed properly on a website, can rake in over $90,000 a month in holding a company or individual’s files hostage. At Renascence IT Consulting, we have seen ransomware first hand from companies who call us in a panic. This costs them thousands of dollars in sales and/or productivity, not to mention the amount of time to restore their data, if possible. We prefer a proactive strategy with our managed services. We use industry leading anti-virus and anti-malware to stop known ransomware before it gets installed. However, since criminals are constantly working to circumvent those products, we ALSO use screening techniques prevent it from running properly if it DOES happen to get around protection hardware and software. We make sure that clients have proper backups not only for this but for other disasters that may strike a company, whether natural or man-made. If you feel like your business could be held for ransom, please contact us for more information. A discovery was made public late last week about how USB sticks/keys can infect systems with malware completely undetected. Code in the actual hardware for USB allows software to be installed that can bypass filters and programs that normally can scan for such programs. How can your company function and stay protected if your employees and staff are utilizing USB technology? There are many options and we can assist at Renascence IT Consulting, Inc. Contact us and we can make sure that your company is safe from unprotected USB sharing. There have been articles coming out recently that the need for anti-virus is no longer doing its job and people shouldn’t be burdened with it and instead use an anti-malware solution. Many programs out there are bloated and do not do detection and removal like they should. We have seen plenty of those solutions, and many are old stand-bys that are now trying to rest on their laurels instead of improving the quality of their product. At Renascence IT, we constantly look at ratings and performance of anti-virus products twice a year. We look at reviews by companies that do not accept advertising from vendors, thus the level of bias is not there for "favoring" a certain solution over another. That being said, we believe the MORE protection you have the better. This includes an anti-virus product AND an anti-malware product. much like you have a car with a seat belt and an airbag, they complement each other in keeping your browsing and computer use safer. By not using an anti-virus product, you DO leave yourself open to older viruses that are still out on the internet. It is much like turning on your alarm on your house when you leave, but opening up all your windows on your way out. If you feel that your company might be suffering from anti-virus bloat, or that your machine is infected or just running slow, contact us and we can assist. I normally don’t Blog my titles in caps, unless I consider something significant. This one is really large. A vulnerability has been discovered called "Heartbleed". It is so big, many of you probably heard about it on the news since it affects close to 500,000 websites. Without going into detail, this has been around for over 2 years and effectively caused ANY internet website you have gone to and signed in has had its password files stolen and decrypted. They just fixed it this Monday. Many sites (Google, Amazon, Yahoo, etc.) have made the necessary security certificate changes to lock them down, but it doesn’t prevent the damage that has been done. We STRONGLY recommend that you change ALL of your internet login passwords to prevent any financial, proprietary, or other information from being taken from you. If it comes up UNSAFE, do not use the site and be sure to alert the support team of the site as well. For those of you who run websites with logins for your customers or clients, you will want to update your security certificates immediately as anything before April 7th are rendered useless. At Renascence IT Consulting, we constantly monitor threats both large and small that could affect your personal, and business information. Feel free to contact us for more information. 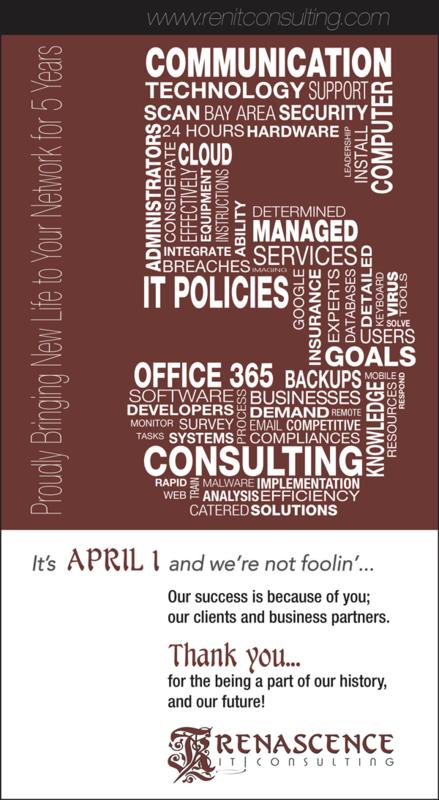 Renascence IT Consulting Turns 4 Years Old Today! Thank you to our clients, partners, and friends that have allowed Renascence IT to be around for its FOUR year old anniversary! Times have changed. Even in this small time frame the "cloud" has moved in on small businesses. This is allowing them to have a serious option of not needing huge, powerful hardware in house any longer for mail, files, accounting, and other office necessities. Devices such as smart phones and tablets have reached a point where many companies can deploy those instead of laptops or desktops to its employees. As a result, first views of websites are not done by computers, but by these portable machines, adding to the need for companies to have mobile friendly versions of their sites. Finally, malware and viruses have gotten more invasive, more lucrative for criminals, and much harder to detect and remove from machines. If your company is stuck in 2000, 2005, or even 2010 technology, feel free to contact us to make sure your not behind the times, suffering data breaches or production slow downs. We look forward seeing what the IT industry is like for small businesses in 4 years and hope you can make that journey with us as well. With the impending end of Windows XP support about a month away, those machines that are still on the legacy operating system are going to be told in a way that cannot be avoided. By using pop up windows, users will be forewarned that after April 7th, Microsoft will no longer patch those systems. In addition, Microsoft Security Essentials will also no longer be updated to new versions. If you are a business still using XP, you are subjecting yourself to malicious attacks, malware, and possibly fines for potential compliance violations. If you need the operating system for legacy apps, there are ways to still protect yourself on those individual machines. Contact us if you need help migrating painlessly or have concerns on systems that cannot be updated. BYOD = Betrayed by Your Own Device? Your company is locked down. You have encryption on your desktops, the latest firewalls, and your wireless is fortress. Password requirements are high, and updates and patches are run continuously. Nothing can get in to steal your data…except maybe your worker’s Iphone, Android Device, or tablet that gets lost or stolen. We have walked into too many clients where people have to use bio-metrics and a badge to enter, and security is locked down. We have also seen where the biggest flaw is their lack of noticing BYOD (Bring Your Own Device) where an employee leaves their phone or tablet on a flight; which just so happens to contain your newest ideas for patents, quarterly financial data, or future road maps for your products. What can be done to lock these devices down when not at the company? Luckily, there are several ways to track phones and tablets, wipe them remotely, and even encrypt them. Better yet, these ways cost little to nothing to implement but add a layer of protection for you business. Feel free to contact us for information, policies, and procedures that can be done to make sure that even when away from home, these devices are not the downfall of your company.